Don Nordbeck said that in the early 1900s Glendale was a place where people came to have a good time. A very social place where families gathered and everyone knew each other. According to Dave Pangburn, in the 20s and 30s, the main points of interest were the railroad station located near today's upper parking lot, the store located near the present restaurant, and the boat yard located on the site of the Marine Patrol. Also Mr. Bates house, across from the store (and still standing), the ice house and the town docks. For those arriving by car, the first building you saw after coming down the dirt road (Dock Road) after leaving Route 11 and the Glendale Road, also dirt roads, was the railroad station. Typical of its time, it had room for a station master, a waiting room and an outhouse, all of which apparently were pretty dirty according to Nordbeck. The small store, he says, was always dark and dirty because of the dust. Occasionally they would use calcium chloride on the roads to keep the dust down. He recalls that once after the roads were treated, Mr. Henderson decided to paint the wooden floor of the store. The chloride took the paint right off so he never tried that again. Pangburn says that the store was the focal point of Glendale, dealing in everything from ice to kerosene –and other items important to the islanders. His favorite was the ice cream –" a treat only to be had at the store as they could not keep ice cream in the "ice box" on the island." He remembers that the kerosene cans of the day had a pour spout with no cap. After filling the can , Mrs. Hendrson, the owner's wife, would go to the potato bin, take out a potato and jam it over the spout. The ice house "was a small two-story building just to the side of the store. In the winter it was filled with large chunks of ice and covered with sawdust. When you needed ice they would climb a ladder to the top of the door, uncover a cake and cut off a smaller piece., As the ice was used up they kept removing boards from the door that ran up the side of the building so that the opening was even with the ice level." Nordbeck remembers that the ice cakes weighed about 400 pounds and that a special axe was used to cut off a square piece. The cost was about .02 cents a pound . Pangburn found it a fun place to visit, especially on a hot summer day. Mr. Bates was " a local character" who sold bait, ran a boat taxi service and sold Tydol gasoline. Mr. Bates wore a primitive hearing aid, the battery of which he carried around in his shirt pocket. He once told Pangburn's father "When she talks (Mrs. Bates) I turn it down to zero and when you talk, I turn it up to 10." His boat, the "Mary Jane"was " the best known boat around. It would only run about half the time. …it was towed in more that anything else." 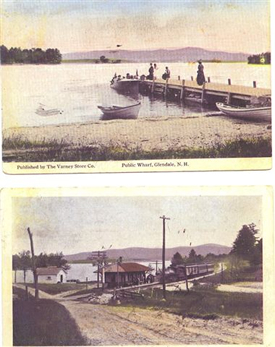 There were 3 public docks located in the same place as they are today. Many rowboats, owned by Mr. Henderson, were beached between the docks. There were no launch ramps. The boat yard, owned by Henderson and in the same location as the present day Marine Patrol, consisted of a large wooden building with a row of garages along the side. Mr Henderson had a "so-called" dock that he used to service the marine railway. A ramp in the middle of the storage building had a power winch to pull the boats up. Once up, they were moved on rollers to the storage point. Thus the first in had to be the last out. This caused a lot of arguments as no one wanted their boat to be the first one in. The yard also did engine repairs, hull repairs and sold gas, paint and oil. The boatyard had a fascination for both Pangburn and Nordbeck . As a youngster it was Pangburn's favorite place to visit and Nordbeck says he hung around morning and afternoon until he was finally kicked out at the end of the day. Parking, often hotly debated today, was not a problem during the 20s and 30s as "not too many people came up here". Henderson rented his garages to car owners and in the winter used them to store boats. Both Mr. Pangburn and Mr. Nordbeck put their cars in the barn up the road at the Boynton Farm. Henderson appears to have been an interesting man, described by Nordbeck as a "walking bank". Anyone who wanted to cash a check would see Mr. Henderson. One night when he came into the store to collect the day's income Nordbeck, who was working, asked him about carrying so much money and Henderson told him he also carried a pistol. He then proceeded to take it out and shoot the insulator off the railroad communication wires. The store later became Dottie's restaurant and the boat yard was sold to Gus Francis and then to John Goodhue. The above information came from a paper written by Dave Pangburn of Lockes Island and from an interview with Don Nordbeck by Janyce Dean in 1993. Both are available in the Thompson-Ames Historical Society which maintains museums at the Mt. Belknap Grange, the Union Meetinghouse and the Benjamin Rowe House in Gilford Village. Please visit our website at www.gilfordhistoricalsociety.org or call us at 527-9009 to arrange a visit.